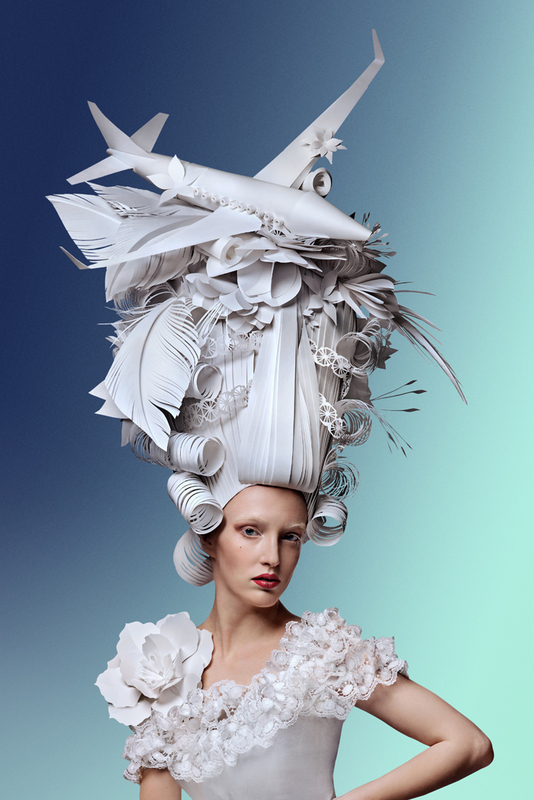 Known for creating exquisite, fashionable and most definitely wearable works of art, like previously featured, artist Asya Kozina has made this incredible collection of paper wigs that incorporates EVERY bit of extravagance. Utilizing only paper and cardboard, they are fashioned in Baroque-era monochrome decadence. Each piece is adorned with everyday objects, whether they are swashbuckling ships or majestic planes, that appear as if to have landed upon a robust cloud. Italian designer and photographer Adriana Napolitano's love for paper is immense and shines through with her incredible set designs completely made of paper. These paper portraits all have various themes, some featuring Adriana herself in several calendar settings, such as the giant wave pictured above, to a gentleman in the full blue luchador costume, to her and her good friend Linus as twinsies! All in all each character that is portrayed, whether her or her subjects, are ultimately covered in or representing paper in some way. My particular fave happens to be the chef attempting to tame his dinner, hehe. The amount of work that she places into creating each of these paper scenarios alone may seem a bit daunting to some, but Napolitano shows loving effort by building all of the costumes, props and sets for her paper portraits and self-portraits herself. She clearly takes pride in this infinitely malleable medium that we all know and love, paper! Benja Harney has created three unique bespoke headdresses for their 2014 Hermès Germany summer party celebrating the theme ‘Métamorphose’. 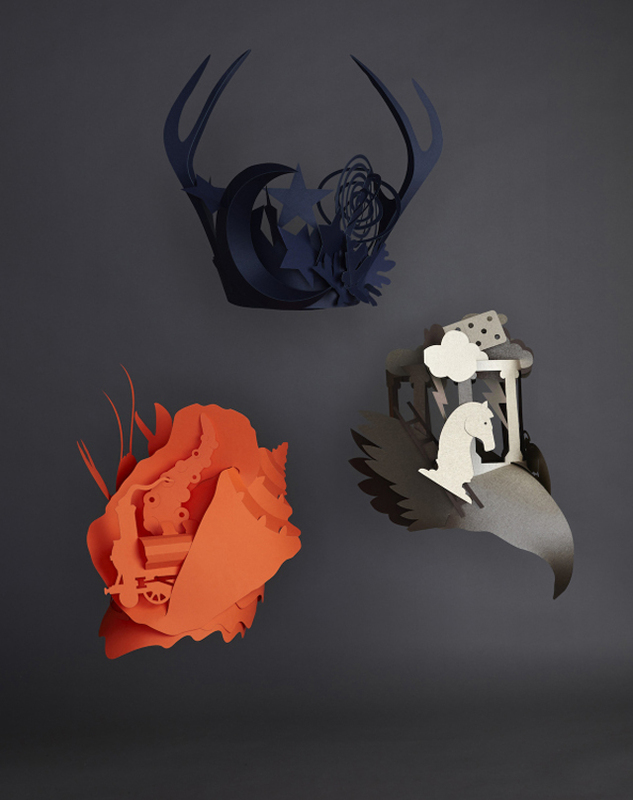 Each papercraft headdresses is unique in its construction, folding and interlocking. What makes each of these gorgeous costume constructs absolutely special is their construction, which requires no use of glue! The headdresses include a helmet fit for Neptune which has sea creatures throughout in orange and also in the shape of a seashell, Diana's dark garland is adorned with deer horns and objects like stars and the moon from the galaxy, and lastly Zeus’ glistening crown has a beak and is covered in thunderbolts, clouds and a column with wings. The guests of the black tie gala evening, held in Munich in a wonderful old chateau, were presented with the selection of different headdresses to wear upon arrival, sounds like a party I would love to attend! Russia-based paper artist Asya Kozina has created these astoundingly intricate paper costumes, which were especially made for the wedding underwear company "Wild Orchid". The different styles that are depicted in this series show the traditional fashion sense of bridal dresses found in countries across the globe, but realized in this ever so delicate medium, paper. The black and white truly captures the the elegance and grace perfectly! Enfaltung, which in german harbors many meanings: unfold, expand or develop, is the basis of this Master's thesis project created by german native Jule Waible for her Design Products program at the Royal College of Art. 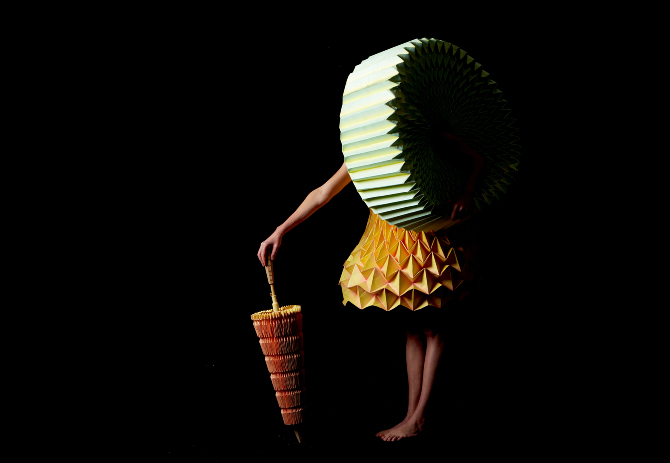 This series features a yellow dress that transformes its shape dependent upon the movement of the body, a green expandable accordion styled bag and an orange umbrella which all use a style referred to as origami tessellation. It is exactly that in which it describes along with the magic of the source of her inspiration, Mary Poppin's enchanted bag. "Collapsible structures reflect how our world is constantly changing," she writes. "My response is to use folding as part of my design process." You may remember the amazing paper collection of intricate fashion motifs in various colors, styles and execution entitled Sur La Plage by talented fashion designer Bea Szenfeld, where she took a medium like paper and transformed it into a robust and risque display that even I would be excited to wear. In her latest fashion collection for Spring/Summer 2014 entitled Haute Papier, Bea has rose to the occasion to deliver an exquisite array of uniquely sculpted pieces with a theme that also incorporates the animal kingdom in, yes you guessed it, paper. I love the playful aspects of the way she chose to dress the models, especially the animals which showcased teddies, bearskins, elephants and even lions. This definitely by far the most impressive fashion display we have yet to feature on that is made of paper in its entirety. These dresses were created by Uruguay based designers Mercedes Arocena and Lucia Benitez for their thesis project. During their research about generations of civilizations they discovered that most garments were built out of rectangles and squares. That lead them to creating this line, "Nintai"--patience in Japanese, which utilizes geometrical figures as the basis of development for these origami-inspired dresses. Their collection uses the aspects of origami such as folding, creasing and building of the structures out of rectangles and patterns without the use of paper. StudioSpass is a visual communication office located in the heart of Rotterdam/NL run by Jaron Korvinus & Daan Mens. They were commissioned to do a photography series and printwork for Bangers, a monthly Boemklatsch club night at cultural stage EKKO, Utrecht. 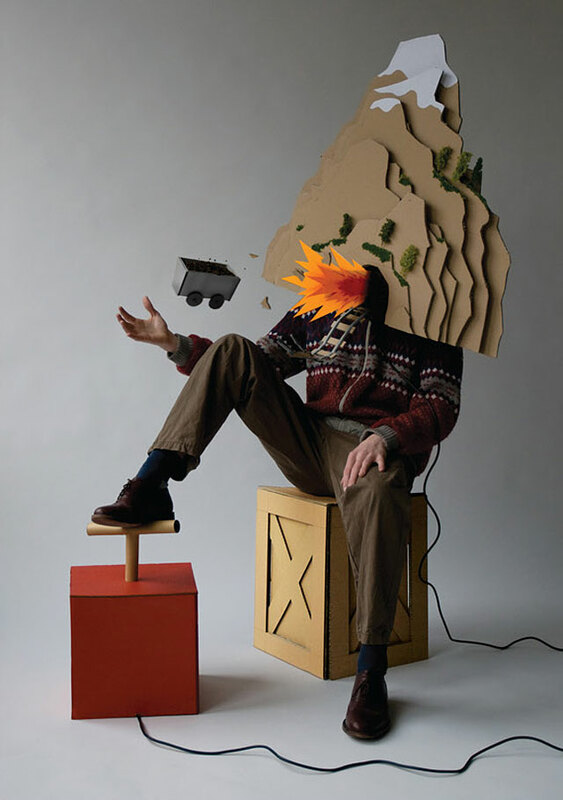 For each edition StudioSpass handcrafted an ‘explosive’ mask made of cardboard along with a setting. 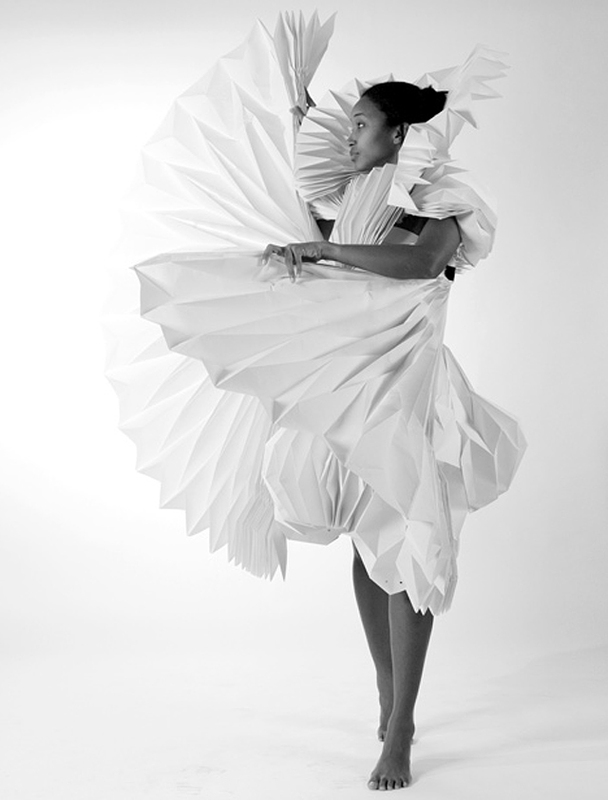 Trinidadian architect Tara Keens Douglas presented a series of carnival costumes made from folded paper as part of her masters thesis entitled Ecstatic Spaces.